The giraffe is the tallest animal in the world. They grow from 14-19 feet tall and weigh from 1,700-2,800 pounds. Giraffes are beneficial to the other African herbivores because of their height. A giraffe is tall enough to have a much wider scope of an area and will watch out for predators. 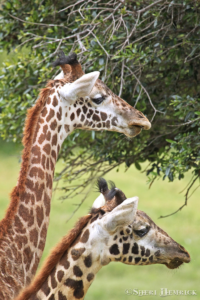 The giraffe evolved a long neck to reach high leaves, making it easier to survive during resource shortages. Tall individuals are less likely to fall victim to starvation. Range: Open woodland and wooded grassland of Africa, south of the Sahara. Conservation Status: Lower risk, increasingly rare in West Africa. A giraffe’s heart is about 6 feet above its hooves and 9 feet below its brain; therefore they have an especially thick sheath of tight skin around the slender lower half of each leg to maintain high extra vascular pressure, just like the effects of a “G-suit” worn by fighter pilots.